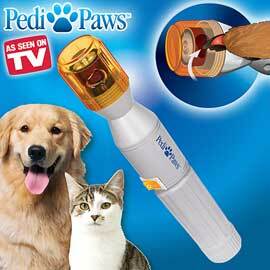 Pedi Paws Gently and Painlessly Trims Pet’s Nails. The secret is the innovative rotary emery bands that gently remove thin layers of nail without the pain of traditional clippers. Protective cap catches the filings for easy cleanup. It’s fast, easy and saves on visits to the groomer! Precision high speed motor operates on two C batteries (not included), cordless, to use anywhere!